ITAM.ORG is a NEW AGE GLOBAL membership organization of ITAM – IT Asset Management Professionals managed by ITAM Professionals for ITAM Professionals. #1 and fastest growing Global Organization with International ITAM Members from 50+ countries. Connecting the ITAM stakeholders on ITAM.ORG Platform for Mutual Benefits. ITAM.ORG Objectives “Provide an online platform for ITAM (SAM and HAM) Professionals and ITAM Providers* to share knowledge on IT Asset Management Best Practices as well as information on International ITAM Standards and Best Practices , ITAM Events, ITAM Conferences, ITAM Surveys, Jobs, Publications, ITAM Certification Training courses, eLearning, Workshops, etc”. ITAM Professional Members – Why Join? Free? 1. Free or Special pricing for ITAM Events, Research, etc. from Major ITAM Providers and Analyst Companies. Why Free ITAM Membership? – The community is totally on-line. Why an ITAM professional be charged exorbitant in the age of internet where the cost of managing a membership is close to zero and events are sponsored by ITAM Providers. How to become an ITAM Professional Member? 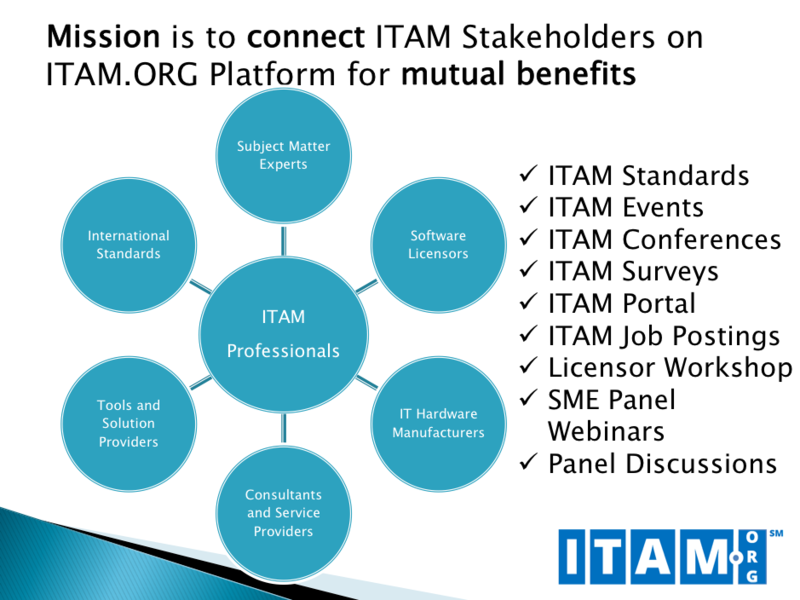 ITAM Provider Member – Why Register and Associate with ITAM.ORG? 2. Immediate Reach to ITAM Professionals of the Only free ITAM membership organization with international presence. 3. Association with ITAM.org helps ITAM Providers publish events using ITAM Event Management System and reach International ITAM professionals / practitioners for Product launch or share information about their offering and demonstrate their services and products. ( Information Systems and ITAM Tools. How to become an ITAM Provider Member? Reach the ITAM Professionals quick and fast across globe. ITAM Organization Member – Why Join? 2. Invites to free or discounted events and product demo sessions from major vendors. How to become an Member ITAM Organization? First and Only Global IT Asset Management Organization – ITAM.ORGanization with largest number of ITAM Professionals, Practitioners, Managers as members with Free Membership.